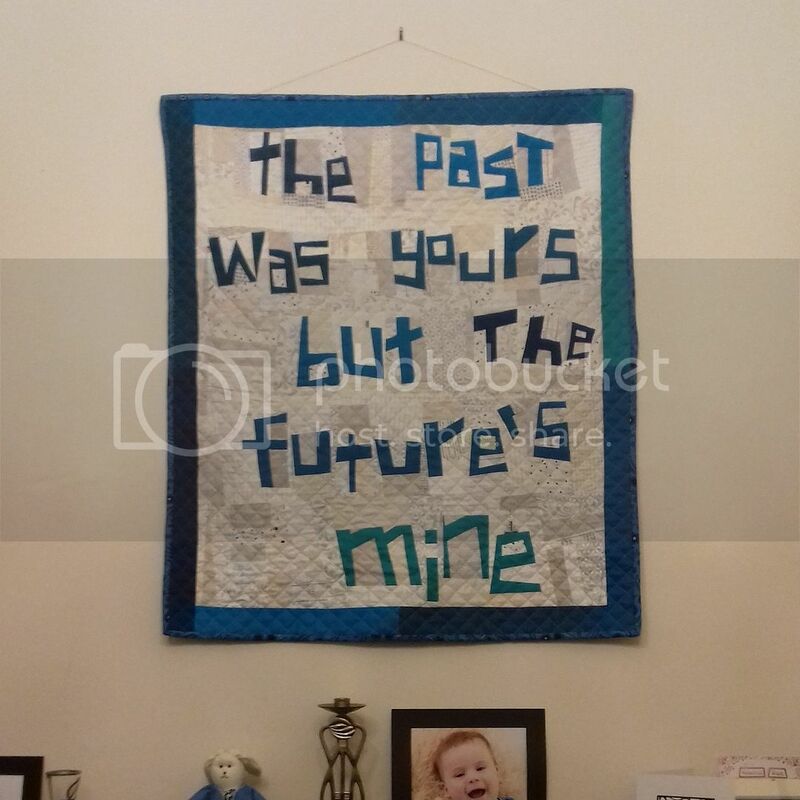 I have been working on this mini quilt for months, and finally it is finished and hanging in my living room! I think I might have shown it to you when it looked like this... but maybe I forgot. 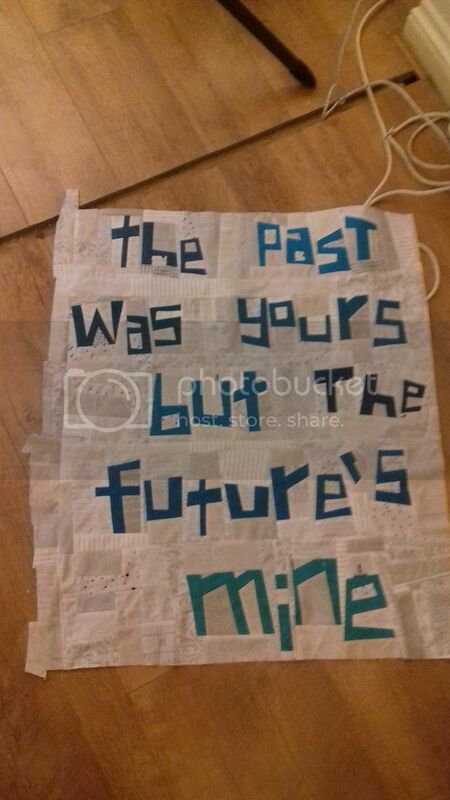 The words are improv pieced (my favourite technique and one I'm teaching tomorrow at the East Midlands Modern Quilt Guild) in shades of blue Kona solids, and the background is scrappy low volume. 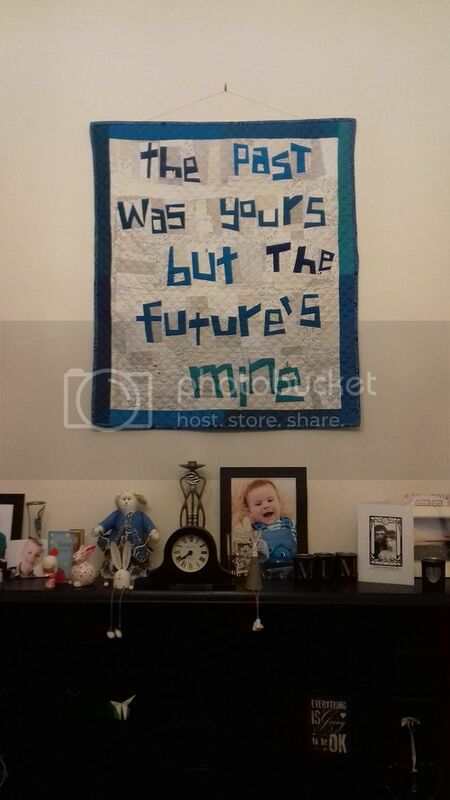 I put a 2" border around it using each of the colours I'd used for the words. I then auditioned a potential scrappy low-volume border v. a blue binding. The blue binding won. It was at this stage I realised I'd made the border to the exact size and it would change as I quilted it! Off it came and a new border went on. Yes, my pjs have sheep on them. Credit. These lyrics are from She Bangs The Drums by The Stone Roses, one of my favourite bands ever. I embroidered the names of the two co-writers using the fonts on my Janome Atelier 5. 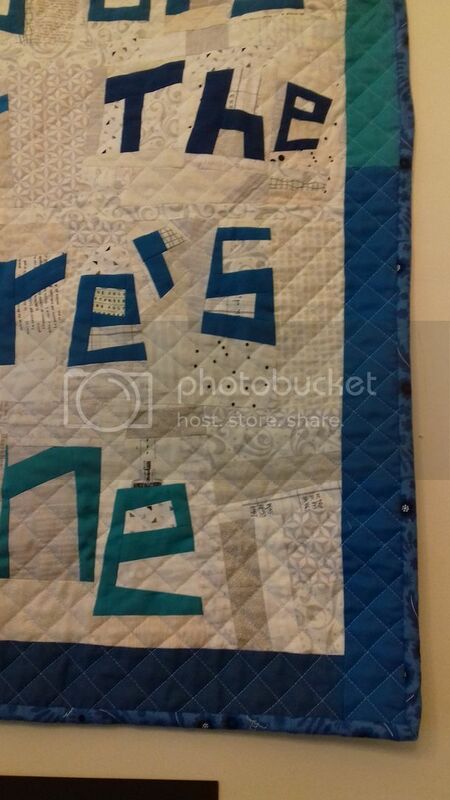 I bound the quilt in a blue Alison Glass print and added hanging corners. I then got my Dremel out and cut a piece of dowel to size. It's hanging from some yarn - I need a better solution than that! I completely forgot to measure it, but from memory of doing the borders, I believe it is 33" wide x 39" long, so bigger than Silent Scream. I took down Silent Scream from above the mantlepiece and put up The Freedom Quilt in its place. Silent Scream was how I felt during depression. 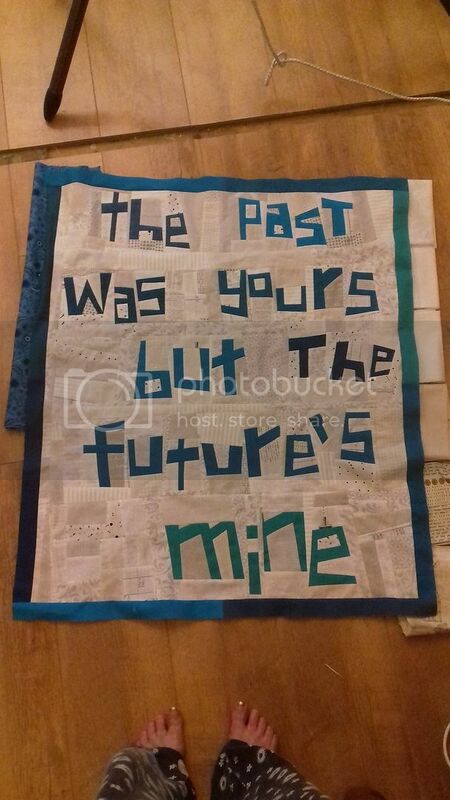 My depression lifted shortly after my husband left so this Freedom Quilt is an expression of freedom both from him and from it. This seems to be the only close up picture I took to show the quilting and the binding. I was planning on free-motion quilting it, but I just couldn't decide what I wanted to do, so I had a go at straight line quilting instead and quilted a grid. 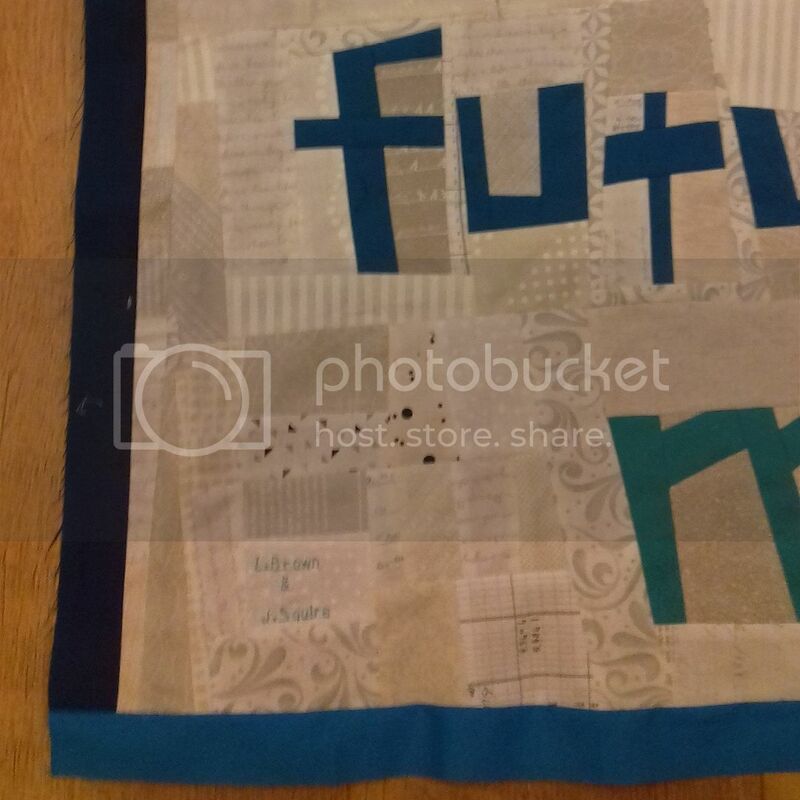 It was fairly quick and easy, but I have to say I prefer the look of FMQ. 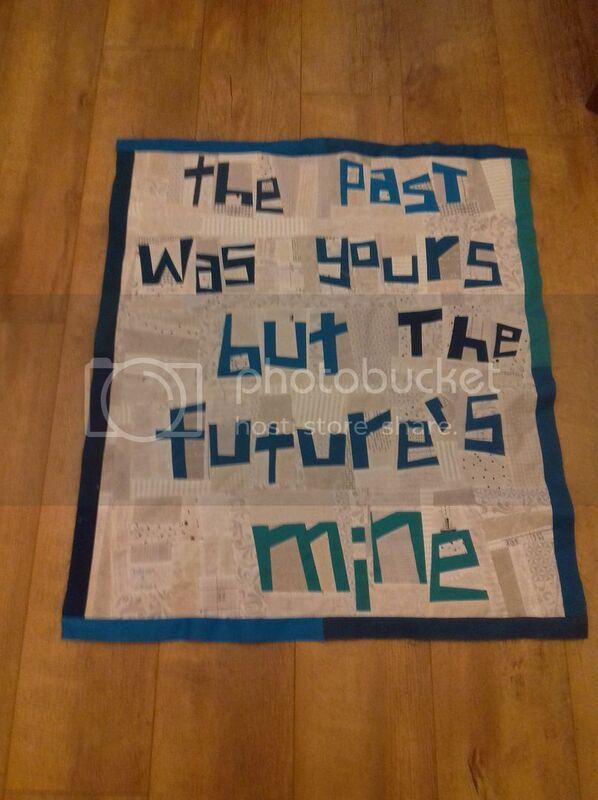 Now to decide on my next lyrics as I'll be starting a new quilt tomorrow.